To some people, a spring roll is a spring roll. Merely a fried cylinder of various meats and/or veggies encased within a flour wrapper. However, there are significant differences between a Cantonese and a Vietnamese spring roll. The first and most important difference is the wrapper itself. A Cantonese spring roll uses a wheat-based wrapper while a Vietnamese spring roll employs a rice-based wrapper. Thus, the actual physical appearance of the fried roll is quite different between the two. The Cantonese one is smooth and uniform while the Vietnamese one is blistered and irregular. The filling is quite different as well. The Vie tnamese roll consists of cellophane noodles, carrots, ground meat and wood ear mushrooms. Sure, there are other variations; but those are the standard ingredients. Now with that in mind, it's incredible so many Vietnamese restaurants in town serve the Cantonese version. To me, that's akin to going to a Japanese restaurant and being served sweet 'n sour pork. Thankfully, there are places that serve the authentic Vietnamese spring roll. 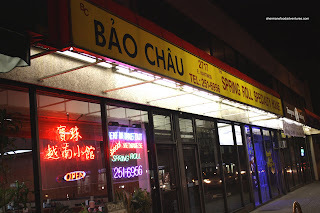 Bao Chau goes as far as claiming that they are the place for spring rolls. Viv and I have been here before, albeit quite a while ago. We return to try the spring rolls again. As you can see in the picture, the spring rolls are indeed very crispy. Not greasy at all, these rolls had the perfect fried texture. However, I wasn't that impressed with the filling. It tasted fine with a hint of fish sauce; but it was way too mushy and loose. I would've preferred a bit more texture. 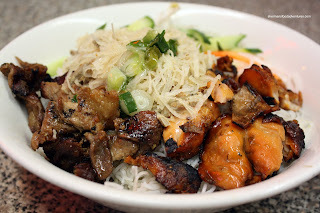 For my main dish, I went for a Vermicelli Bowl with Grilled Pork, Chicken and Shredded Pork (aka pork rind, yum!). The bowl of food was enjoyable to eat with lots of well seasoned and grilled meat. Viv had the House Special Pho which includes every meat possible. The noodles were perfectly al dente and the meats were good; but... the soup was disappointing. It was quite sweet and lacked any rich meat flavour. I still think Pho Tam has the most meaty tasting broth so far for me. Despite its faithful following, Bao Chau was only average for us. Maybe our expectations were too high? Don't get me wrong, it was plenty decent, just nothing all that special. At the very least, they do make a proper Vietnamese spring roll. 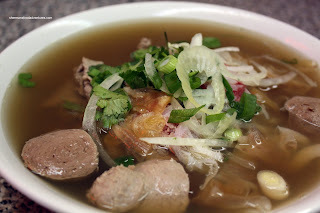 oh~ My favourite viet hole in the wall comfort food place. : ) I don't know, I know its not the best, but there's something about how they season their food. 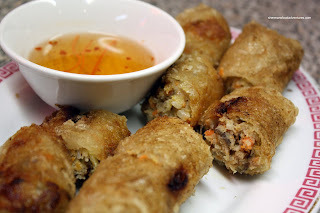 I like sweet, and they do sweet very well..
ohh I had authentic homemade Vietnamese spring rolls..with dungeness crab at my friends place...nothing will beat it now! But the ones you had here look good...and a bit greasy..as expected. Yen, Kim, you 2 are right. It's alright, but hardly the best. But again, food is personal taste and they do have their following. That was our favorite joint before moving to Surrey. Now that we are going to a new place, I realized that their broth was consistantly weak in flavor. If you get the spring rolls before the main they are usually not fresh there. If they come after, they are usually freshly cooked. The staff there is great though!